Project CARS Affiliate Leagues are community Esports events endorsed by Slightly Mad Studios. Featuring some of the world’s fastest virtual drivers. They run in a professional, sporting manner and feature live streamed action AND regularly-scheduled events. WATCH LIVE. WEDNESDAYS AT 8PM UK TIME. ​Apex Online Racing (AOR) run a wide variety of leagues across PS4, Xbox One and PC, but the cream of the crop are the Official Project CARS 2 GT3 Leagues. Races in the GT3 League are streamed live every Wednesday at 8pm UK time, whilst a season is running. Expect expert, entertaining commentary from the AOR team - some of the community's top casters. AOR runs a tiered league structure, so drivers are split into tiers based on their ability, with some getting promoted or demoted between seasons. New drivers usually start off at the lower Tiers. The weekly broadcast features the best-of-the-best, from Tier 1 and Tier 2 on PC. There are equivalent tiers on both Xbox and PS4 too, and you can usually find drivers streaming these races from their own perspective. The Console races also run at 8pm UK time on Wednesdays. Each event has a 10 minute qualifying session, and a 1 hour race. There are multiple seasons of the AOR leagues every year, so please check the AOR website for the latest information about the current season, and availability of sign-up slots. WATCH LIVE ON TWITCH. TUESDAYS AT 18:00 BST/GMT. You may remember Actrollvision from Project CARS where he hosted the very successful official Project CARS GT4 league, also you may remember him from the ESL Go4 Cups, Multi-Class championship, SMS-R Championship and World Final at Gamescom. He is back with not just an official league, but an official league meeting. Tailored for your viewing pleasure. The weekly meetings consists of three leagues, (GT5/GT4/GT3) with a relegation and promotion system from GT5 "beginners" to GT3 "experts." The GT5 and GT4 leagues will be commentated on by Actrollvision himself (and guests), and the GT3 league will be from his racing POV. The leagues are for PS4, but he will be looking to run simultaneous events across PC and Xbox when demand is there. These leagues will be live every Tuesday evening from 6-9pm BST/GMT At twitch.tv/Actrollvision and at facebook.com/Actrollvision. You can also find the streams shared on the Project CARS Facebook page. The RevolutionSimRacing (RSR) crew is one of the longest running groups of organized sim-racers running in Project CARS - going all the way back to the early days of WMD. Season 5 of the well-established Revolution Cup has arrived and what a season RSR has in store. With 4 highly successful seasons of trackday and GT cars behind them, they are hitting the ground running with an all-new format and a new class of car. Say hello to the highly requested Formula Renault 3.5. 530hp of open-wheeled, V8, DRS-equipped delight and weighing in at just 623Kg. This is going to be RSR's fastest season yet. After the success of the PRO-AM format of Season 2, 3, and 4, RSR will be continue with this format for the following season. The races will be streamed by multiple drivers here. Read through the Driving Standards. Register at the RSR website. Take part in at least one Induction Night to earn your Probation Status. Sign up for the league. More detailed information about the league can be found here. HOW CAN MY LEAGUE EARN "OFFICIAL" STATUS? 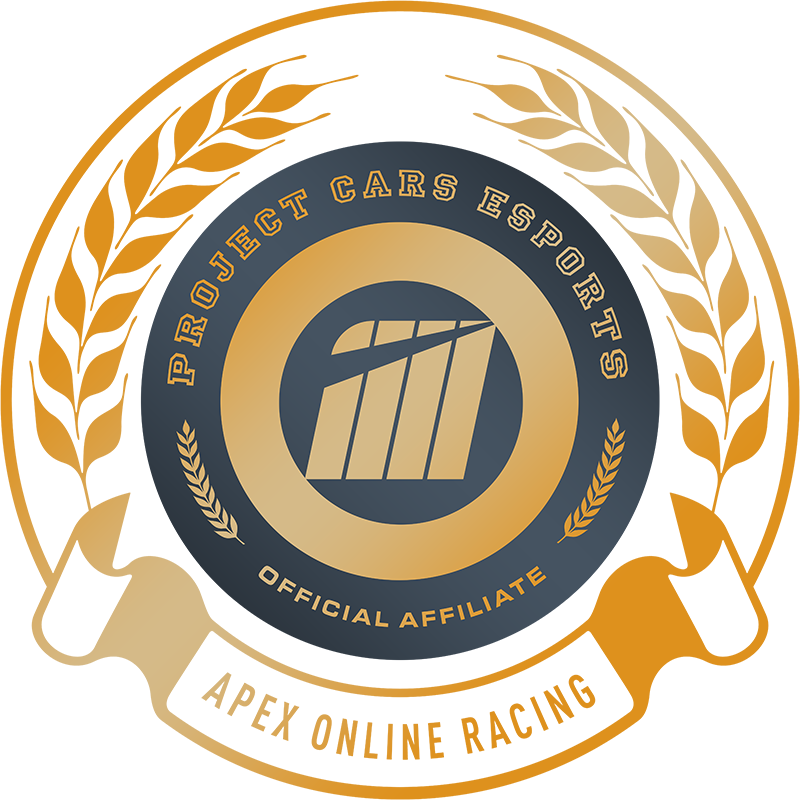 ​Currently, we are not actively searching for new leagues to join the Project CARS Affiliate Leagues Program. There is no submission process by which leagues will be considered. Instead, Project CARS staff are watching a wide variety of league racing and will contact you directly should they wish to include your league in the program. In general, only leagues which meet the following criteria will be considered. Please use Apex Online Racing, Actrollvision, and Revolution Sim Racing as examples of the kind of organisation you should be aiming at. If your league ticks these boxes, then you could see it promoted here in the future.